10th place for Michael Milinovich in the 200 fly. Badgers can take sole possession of first place in the Big Ten tonight. We're ready, are you? 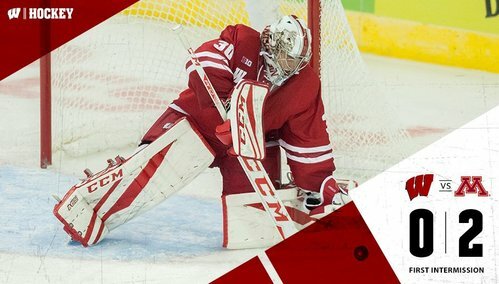 Matt Jurusik in goal tonight for the #Badgers . Eric Schierhorn for Minnesota. Game 32: HEY. DROP. THE. PUCK. 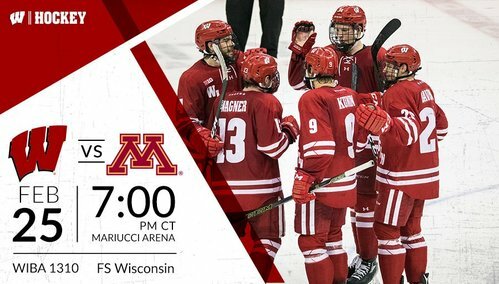 Badgers have Wagner-Hughes-Besse as the second line. Now UW has Cavallini-Malone-Johnson, so some changes from the line chart. Ramsey with a one-timer but Jurusik with the glove save. Media timeout with 13:23 to play in the first. 13:23 left in the first, scoreless. A more aggressive start for UW than last night. Five minutes into the opening period and we are still scoreless. Gophers leading 3-2 in SOG in the early going. Schierhorn has had to make two saves on UW's Freytag so far, the most recent a right pad kickout. #GOPHERS GOAL! Rem Pitlick picks up a pass from Sheehy and gets it by Jurusik! 1-0 Minnesota! GOPHERS GOAL: Rem Pitlick scores between Jurusik's pads in transition. 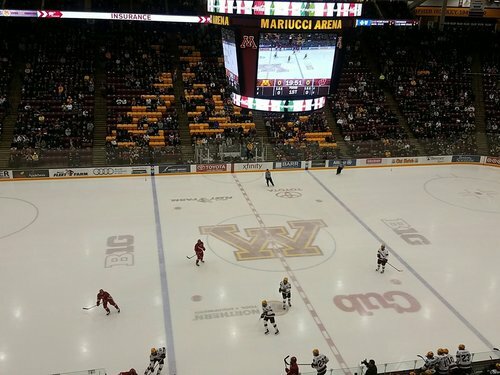 1-0 Gophers over UW with 11:36 left in the first. 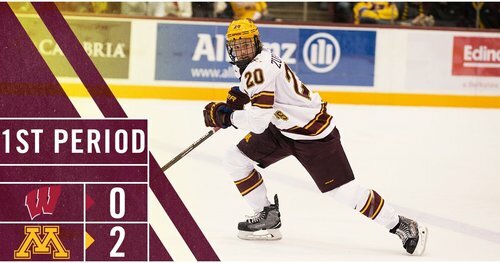 Gophers open the scoring with 11:36 left in the first period. #Gophers will have the first PP of the night as Frederic is called for hooking. Media timeout with 8:14 to play. UW's Frederic called for hooking in the offensive zone, putting the Gophers on the power play with 8:14 left in 1st. Minnesota leads 1-0. Frederic is called for hooking with 8:14 left in the first. Badgers will send out their PK unit for the first time tonight down 1-0. Jurusik covers a bouncing puck with 23 left on the Gophers' man advantage. Kill! Frederic steps out of the box and we are back to even strength. 6:14 left in the period with Minnesota leading 1-0. Lettieri off for slashing, Bunz for roughing after the whistle, so it's 4-on-4. Penalties given to Lettieri and Bunz for slashing and roughing after the whistle, respectively. 5:43 to play, 4x4 hockey for two minutes. Coincidental minors assessed to both teams and we will skate 4-on-4 for two minutes. Gophers have had the last seven shots on goal, starting with Pitlick's goal. Now 10-3 for Minnesota in shots. Both teams at full strength after the #Gophers earn a few good looks on the 4x4. Back to 5-on-5 with 3:43 left in the period. Badgers down 1-0. Sheehy gets a wrister off that makes its way through traffic but no luck finding the back of the net. 2:02 to play in the first. UW's Tischke goes off for tripping with 1:28 left in the first. Gophers on their second power play, leading 1-0. #Gophers will have another PP, this time Tischke is called for tripping. 1:28 to play in the first. UW will send out the PK unit with 1:28 left in the first as Tischke is sent to the box for two minutes. #GOPHERS GOAL! This time it's Ryan Norman as he bats a puck in with 4.7 seconds remaining in the period!! GOPHERS GOAL: Ryan Norman bats the rebound out of the air with 4.7 seconds left in the first for a 2-0 Minnesota lead over UW. 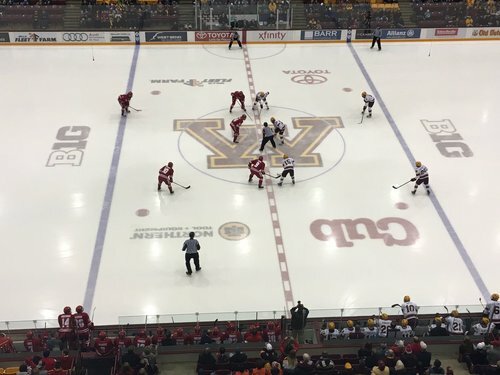 END 1: Minnesota leads Wisconsin 2-0 on goals by Pitlick and Norman (PP). Shots on goal 15-5 for the Gophers. #Gophers lead the Badgers in shots 15-5 after the first period. Sheehy's assist on the Pitlick goal is his 29th of the season, a team-high.